ATLANTA, GA, JULY 1, 2017 – Katrina’s Dream, ERA Action and a roster of national leaders and advocates from across the United States will gather, Friday, August 25 – 27, 2017 in Washington, DC, in the fashion of Women’s Equality Day founder, the late Congresswoman Bella Abzug; insisting on hearings for the current Equal Rights Amendment, ERA of just 24 words, which comprises the Joint Resolutions, SJR 5 and HJR 53, to remove the deadline for ratification. 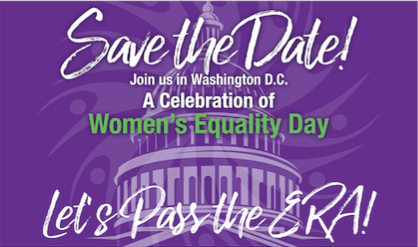 The 2017 Women’s Equality Day rally in DC follows the Equal Rights Amendment, ERA ratification led by Nevada State Senator Patricia Spearman March, 22, 2017. The Third Annual Rally continues with the call of advocacy that begins with a day of action on Capitol Hill from St. Stephen and the Incarnation Episcopal Church, 1525 Newton Street, NW, Washington, DC.